To recommend on a regular basis (every two years beginning in 2009) the name of a living American poet or anthologist to the NCTE Executive Committee to receive the NCTE Children's Poetry Award in recognition of his or her aggregate work. To establish an annual list of Notable Poetry Books published in the current year by any poet, living or deceased, and of any nationality. To establish an annual list of Notable Verse Novels published in the current year by any poet, living or deceased, and of any nationality. To sustain a collection of poetry books of past and future award winners in the University of Minnesota, Kerlan Collection. To recognize and foster excellence in children’s poetry by encouraging its publication. To explore ways to acquaint teachers and children with poetry through such means as publications, programs, and displays. 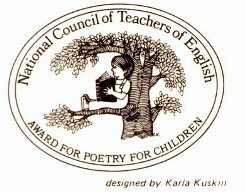 This document was printed from http://www.ncte.org/volunteer/groups/poetrycom.